Entitled Kokugun Zenzu and printed c. 1838 (Tenpo 9), this is an early Japanese atlas of exceptional rarity, beauty and importance. Compiled by Motonobu Aoo and Toshiro Eirakayu based upon the works of Japan's 18th century master cartographer Ino Tadataka, this set of two volumes contains more than 70 regional maps of Japan. Each map offers spectacular beauty and detail exhibits traditional Japanese cartography at its finest. Such atlases were compiled by order of the Shogun Tokugawa and given as gifts to his favored warlords. Many of the feudal fortresses in Japan were subsequently destroyed by war and fire, their archives were lost, and thus few such examples survive. 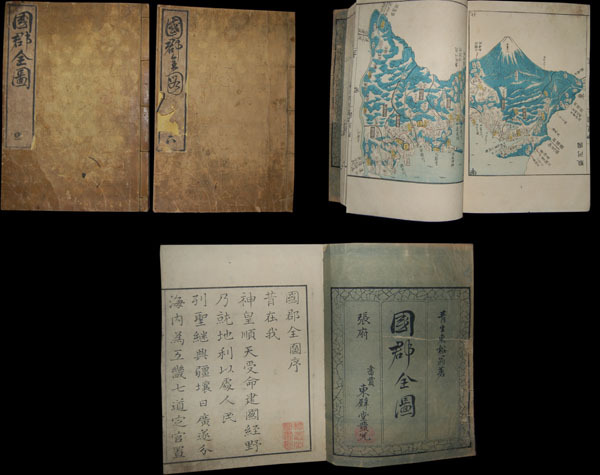 Further Ino Tadataka material is additionally rare as most of his surviving maps were assembled in the late 1800s by an imperial functionary and avid Ino collector. They were subsequently stored in the Royal Palace archives which were themselves, tragically, destroyed by fire in 1912. There are two different versions of this atlas. Though both have the same maps, one is a 'deluxe' edition, is larger and printed on heavy paper. The other is printed on very thin paper and is physically thinner. This is the 'deluxe' edition. Ino Tadataka (February 11, 1745 - May 17, 1818) was a Japanese surveyor and cartographer and is considered to be one of the fathers of modern Japan. Ino Tadataka was born in Kujukuri, a coastal village in Kazusa Province (Chiba Prefecture) and little is known of his early years. What is known is that at age 17 he was adopted into the prosperous Ino clan. The Ino family were wealth rice merchant and saki brewers based in Sawara (now a district of Katori, Chiba), a town in Shimo-Usa Province. Ino Tadataka served the family interests for nearly thirty-two years before turning his interests to mathematics, astronomy, and cartography. He moved to Edo (modern Tokyo) and there apprenticed himself to Takahashi Yoshitoki, a specialist in astronomy under the Tokugawa Shogunate. After five years of study he petitioned the Shogun for permission to map the coastline of Japan using modern techniques and his own money. The Shogun approved and Tadataka spent the next seventeen years surveying the country on foot. This monumental work resulted in a map and subsequent atlas of such extraordinary accuracy and detail that would be the definitive mapping of Japan for the next 100 years. The maps and atlases for which Ino Tadataka would be forever known were compiled by his friends and family and published approximately three years after his death. By the late 19th century Ino Tadataka's maps had become the standard for Japanese cartography and were avidly collected by wealthy merchants and bureaucrats throughout Japan. One such, a functionary in the Imperial household, actually managed to collect most of Ino Tadataka's surviving work which he stored in the Royal Palace. When the Palace was destroyed by fire in 1814 most of this prized collection went with it. Today Ino's maps and atlases are consequently of extraordinary value and rarity. Very good. Some scuffing to covers, contents solid. Binding tight.